December means many things: Christmas shopping and holiday parties; snow and winter sports; baking and decorating; reflecting and preparing for the year ahead. And in the dance world, December means “Nutcracker”. Each December, the performing arts community and the “Nutcracker” become reacquainted. Folks may attend a single “Nutcracker” or several different ones. The shows can range from school versions all the way to professional companies. “Nutcrackers” may be brand new or they may be part of an annual tradition. For a dance critic, the challenge here is keeping “Nutcracker” commentary fresh. And in pursuit of this goal, a plethora of techniques and strategies can be employed. One obvious choice is to focus on something unique every year; a new focal point, if you will. Perhaps the story, the choreography, a particular role or one specific scene. This year, let us look to the standout performances from opening night of San Francisco Ballet’s “Nutcracker”. While Act I’s party scene is more of a narrative experience, it does have some lovely (and challenging) variations, especially in Artistic Director Helgi Tomasson’s production. The Doll is one such dance, and as interpreted by Elizabeth Powell, it is the first performance highlight. Powell is technically strong, but what made her ‘doll’ better than others was her ability to stay true to character the entire time she was on stage (both in her featured solo and when she reappears briefly before the battle scene). Many dancers are able to convey the doll’s isolated movements but tend to lose the character authenticity when the choreography gets difficult. And it does. The doll does multiple sets of single footed relevés and a circular series of quick piqué turns. Powell and her role were one; hers was an amazing transformation. Joan Boada in Tomasson's "Nutcracker"
The second noteworthy performance of the evening was Joan Boada as the Nutcracker Prince. 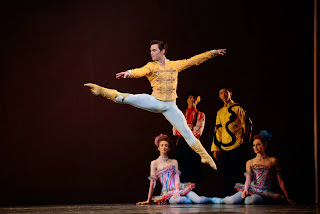 Boada’s virtuosity in the grand pas de deux, his solo and the coda was out of this world. Not just because of his astonishing multiple turns (which he completes up in turning position, rather than down on the floor), dynamic circuit of jetés en tournant or gravity-defying ballon, but also because he hits every fifth position, whether in preparation or in transition. And his smile radiates pure joy, not at all pasted on. In addition, Boada pays equal attention to the Prince’s various storytelling interludes – those sections of the ballet that are more about acting and less about choreography. The final mention goes not to an individual but to a group of dancers – the ‘Waltzing Flowers’, led by Sugar Plum Fairy Vanessa Zahorian. One of Act II’s longest movements, this year’s performance was one of constant motion and beautiful suspension. The corps de ballet is a continuously changing entity, with new dancers being added and others moving on. And because of this, it can be tough for the corps to gel as a group. But this particular sub-set of the corps de ballet was a technical and narrative team, working together to convey the grace and elegance of this chapter. Throughout the waltz, the Sugar Plum Fairy has several featured moments – Zahorian transcended expectation. The landings of her jumps were as light as air; inaudible at times. And her relevé fouettés were magic. There was only one thing that seemed out of place at San Francisco Ballet’s opening night performance, and it was the internal bows. In any ballet, including “Nutcracker”, there are the final bows, where all the participants take their well-deserved acknowledgement. But there are also bows that happen within the performance, usually following a featured variation. The majority of them were spot on, but a few were really drawn out, and not as a response to the applause. It felt strange, even maybe a little awkward; some tightening up would be helpful.